Three 12VDC outlets - 15 amps total. 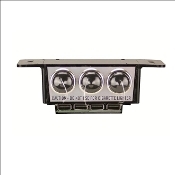 Four 5VDC USB ports provide a convenient ways to stay connected on the road. Each pair of USB ports is rated at 2.4 amps total with individual ports handling 1.2A each or one port each pair handling 2.4A. Attached plugs keeps receptacles clear and free of dirt and moisture. Ideal for spot lights, cell phones, radios, tablets, dash cameras, etc. Nice addition for vehicles, boats, campers or RVs. 2"H X 3-1/4"D X 6"L.
Includes 3 foot wire for simple installation.